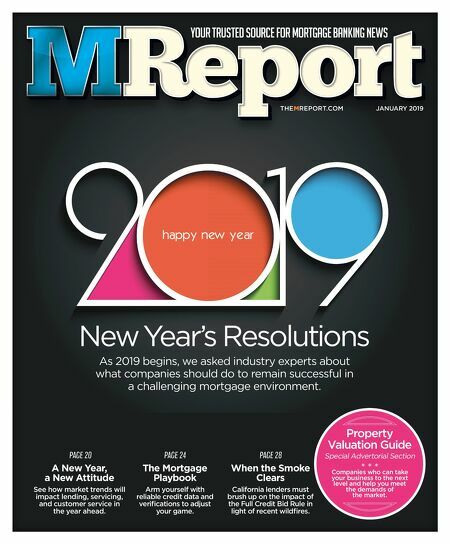 YOUR TRUSTED SOURCE FOR MORTGAGE BANKING NEWS THEMREPORT.COM JANUARY 2019 Property Valuation Guide Special Advertorial Section * * * Companies who can take your business to the next level and help you meet the demands of the market. New Year's Resolutions As 2019 begins, we asked industry experts about what companies should do to remain successful in a challenging mortgage environment. PAGE 20 A New Year, a New Attitude See how market trends will impact lending, servicing, and customer service in the year ahead. PAGE 24 The Mortgage Playbook Arm yourself with reliable credit data and verifications to adjust your game. PAGE 28 When the Smoke Clears California lenders must brush up on the impact of the Full Credit Bid Rule in light of recent wildfires.